Provides a set of predefined font weights as static property values. 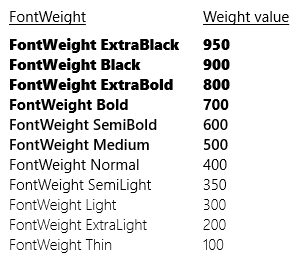 This example shows how to set the FontWeight property on a XAML TextBlock. In standard typography API, the weight of a font is expressed by using constant names, for example "Bold". Using constant names for setting a font weight property is supported through type converter behaviors and also by the FontWeights support class. For code access, the relevant information is expressed as the Weight factor of a FontWeight value. This image shows the various font weight values applied to text. Specifies a font weight value of 900. Specifies a font weight value of 700. Specifies a font weight value of 950. Specifies a font weight value of 800. Specifies a font weight value of 200. Specifies a font weight value of 300. Specifies a font weight value of 500. Specifies a font weight value of 400. Specifies a font weight value of 600. Specifies a font weight value of 350. Specifies a font weight value of 100.